Just 5 ingredients make a great tasting roasted chicken. 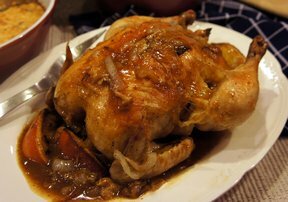 Reserve some of the pan drippings to prepare Perfect Chicken Gravy to serve with the chicken. 1. Preheat oven to 375Â°F. Place chicken on rack in foil-lined roasting pan. Brush with oil. 2. Mix rosemary, seasoned salt and thyme in small bowl. Rub evenly over entire chicken. 3. Roast 1 to 1 1/2 hours until chicken is cooked through. 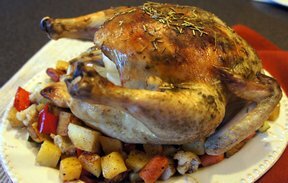 Serve with Perfect Chicken Gravy, if desired.Peppered Roasted Chicken: Prepare as directed. Omit rosemary leaves. Stir 1 teaspoon McCormickÂ® Ground Black Pepper and 1/8 teaspoon McCormickÂ® Ground Red Pepper into seasoning mixture.